Prepare mixed drinks smoothly and efficiently with this stainless steel liquor pourer with tapered speed jet. This sleek and professional-looking pourer is specially designed to save you money by regulating pour quantity and increasing service speed. 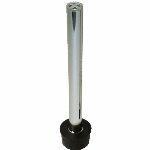 The long, tapered spout allows for more accurate, directed pouring, to help you avoid spillage and keep an eye on quantity. Functional and sharp, this liquor pourer is sure to be a good fit at any bar or restaurant. To clean, simply hand wash in soapy water. 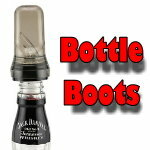 This pourer is easy to remove and replace and fits a multitude of different liquor bottles. 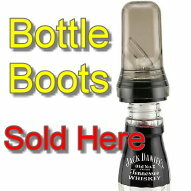 #1 Selling Liqour Pourer In The World!! The 285-50 liquor pourers are the top selling whiskey pourers in the world, used by most National Chain Bars and restaurants for it's durability and consistency. 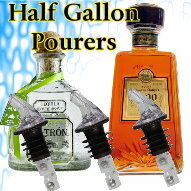 This bottle pourer is the liquor pourer used in most National and International bartending competitions. Flair bartenders love this pourer for it's ability to hold the liquor in the bottle while performing full bottle rotations, flips and spins. The 285-50 spill stop liquor pourer is by far the best selling pourer here at Bottles-Up. If you are looking to add consistency to your drinks then this pourer is the pourer you need. Bartenders are better able to control their counting process for free pouring with this pourer due to it's even flows of liquor. As with any bottle pourer, weekly cleaning is a must to insure a long life of your pourers. I bought these for my at-home bar. I like the metal pourers over any other, great for the price and I would buy them again. These are great spouts and are performing well so far. No issues whatsoever. Absolutly the best pourers you can buy! Put these on all the bottles, get an exacto pour and teach your bartenders to pour perfect every time. Look and any big corporate restaurant and you will see these pourers behind the bar. They work, they last and they pour steady each and every time. Also, they are USA Made!!! !